The weather is warming up, and you want to get outside and hang out on your deck. But first, make sure it’s in good working order. Through the winter, decking materials, whether wood or synthetic, are exposed to the elements in more drastic ways than at other times of the year. This means they’ve been subject to an increased risk of movement due to expansion and contraction from fluctuating temperatures and standing moisture, and as such, potential damage. Here, we’ll review a few of the main issues to look for and what needs to be done to shore them up. Understand that a deck is a structural member of your house. It’s designed and built to carry weight loads, so inspecting it is more involved than ensuring the finish looks good. If you notice that the surface of your decking is looking worn, the boards are cupping/ bowing or screws/nails are popping, it stands to reason that beneath the surface, the boards, supports or framing could use some attention. Start by looking at the joists — what’s actually supporting your deck boards. Most decks are built with pressure-treated wood, which is prone to some bowing or warping, but if the warping is pronounced, it could cause the deck to pull away from the house. Also, pay attention to how your deck is joined to the house. It should be fastened with a band board, which attaches to the framing member of your house. Make sure it’s solid. If you see signs that it’s not, it’s a fairly straight forward fix. Lag bolts and screws designed for decks will secure it, but also ensure joist hangers were used. (Older decks may have a ledger strip, which is a piece of wood that the joists rest upon; however, this method alone is inferior, as the ledger can pull away and cause a collapse.) A joist hanger is a metal brace that attaches to the band board and then holds the joist in place for a more stable fit. Next, examine the posts that support your deck. Most decks have concrete piers that the posts attach to; however, a wood post — even pressure-treated wood is subject to rot at that junction. As you conduct your inspection, make sure the concrete hasn’t settled due to a shift in the slope or erosion (this is also a good time to make sure water flow from downspouts is directed away from the deck posts). If you notice issues here, don’t ignore them. Uneven shifting of the piers/posts could pull at the band boards and joists, causing your deck to pull away from the house. To fix it, you may have to replace the post, if the settlement is that great, or you can elevate the post with a deck-post base or concrete member. Extreme movement could make it necessary to pour a new footing. Finally, look at the railings, spindles, etc., to ensure they are tight and, like the other deck components, secure any loose ones to prevent dangerous falls. Chances are that your deck is structurally sound and simply needs a good cleaning or a fresh coat of stain. The key here is to be gentle! Don’t rent a power washer, then blast your deck thinking the more force you use, the cleaner it will be. You’ll ruffle the wood fibers, causing splinters or popping fasteners. Instead, use a little elbow grease, a cleanser designed for decks and a long-handled, wide-bristled brush to scrub dirt and grime away, then rinse with a garden hose. 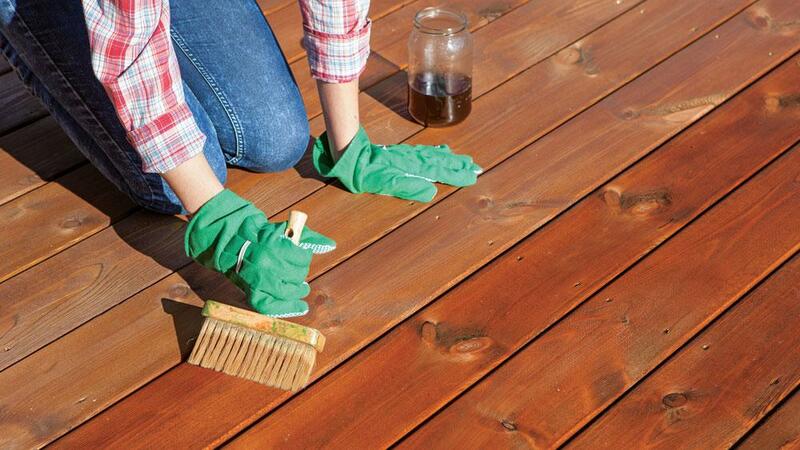 If it needs to be re-coated, always use deck-specific stains and sealants. If you feel like you’re in over your head, don’t hesitate to reach out to a professional for help. Your safety, as well as that of your family and friends, is too important to leave things to chance.